Friday, May 12, during the annual Bradenton Area Convention and Visitors Bureau National Tourism Week Celebration, Greg Campbell was announced the 5th Annual Tourism Ambassador Award winner. Since 2012, individuals have been chosen annually to receive the Bradenton Area Tourism Ambassador Award. This honor, presented by Manatee County Commissioner Carol Whitmore and the BACVB Executive Director Elliott Falcione, recognizes individuals who have made a significant, positive impact on the development of Bradenton, Florida as a desirable visitor destination and have curated the best possible guest experience. Greg Campbell, Executive Chef and General Manager for PIER 22 Restaurant and Catering received the 2017 Bradenton, Florida Tourism Ambassador Award at an industry event celebration held at the Bradenton Area Convention Center. Chef Campbell learned the art of cooking at the hands of his French grandmother, Simone Hubert. Together, in her kitchen in Rhode Island, they made delectable creations always prepared with love and often using bacon. Throughout young adulthood, Greg continued to improve his culinary skills and expertise in restaurant operations. In 2006, Campbell accepted a position with PIER 22. Campbell and the PIER 22 team are known for their commitment to providing customers with outstanding service and quality scratch-cooked meals. Guests recognize the landmark restaurant as more than a refined culinary destination. For many patrons, PIER 22 is a material component in the way that they relax during a Bradenton, Florida vacation and essential to the way many locals and visitors celebrate the holidays. Upon receiving the Tourism Ambassador Award, Campbell stated "it's about taking care of people like they're your family and I try to emanate that in the restaurant. He joked about several bazaar guest requests but reminded his peers in tourism that it is "critical" to take care of all visitors to the Bradenton area no matter what it takes. Campbell and his team can often be found working with Realize Bradenton to sponsor local tourists events like the Bradenton Blues Festival among many others. Campbell is a longtime member at large for Sarasota-Manatee Originals; he is also a Florida Restaurant & Lodging Association member. 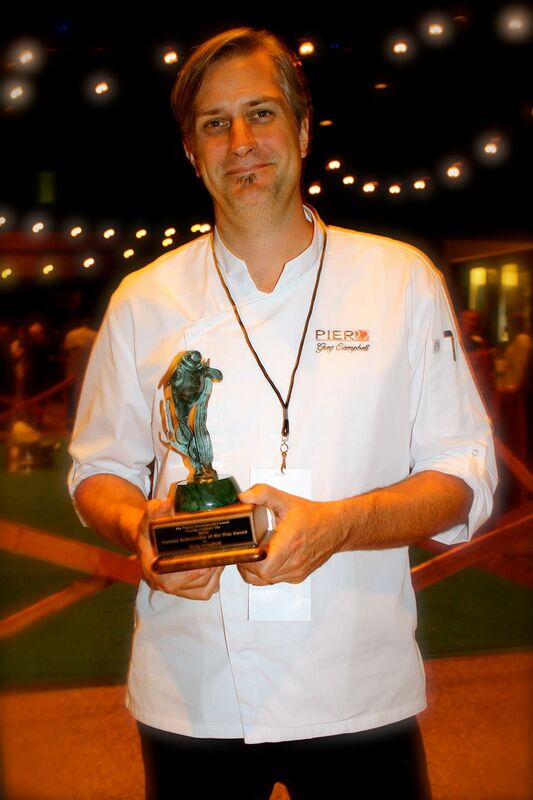 In 2013, Chef Greg Campbell received the honor of Best Chefs America. Campbell and his team work daily to provide visitors with memorable dining experiences that keep them coming back to the Friendly-City. "I challenge myself and everybody here to do their best," Campbell remarked in his closing. Previous Tourism Ambassador Award winners have included restaurant and tourism industry leaders such as the CEO of the Chiles Group, Ed Chiles, and John Horne, CEO of Bradenton’s Anna Maria Oyster Bar and Manatee County Parks and Natural Resources Department Director Charlie Hunsicker. The Bradenton Area Convention & Visitors Bureau promotes tourism to Bradenton/Anna Maria Island/Longboat Key area and the rest of Manatee County, including Palmetto, Holmes Beach, Bradenton Beach, Cortez, Ellenton, Myakka City, Ft. Hamer, Lakewood Ranch and Parrish, through domestic and international advertising, public relations and marketing efforts.